Gloucester Fair is running at Hempsted Meadow all over Easter. The Gloucester Car Boot Sale is open on the Wednesdays and Sundays. 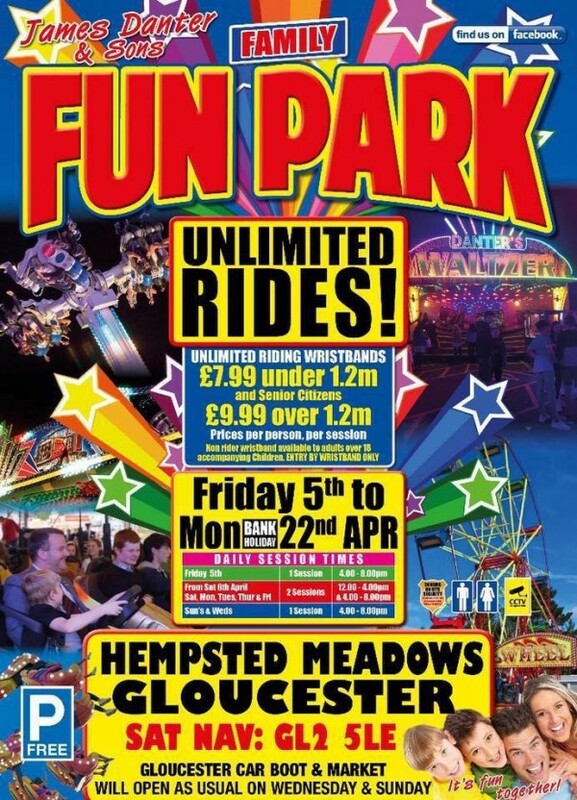 So if you want some unlimited fun on the Danter's Family Fun Park, check the session times in the poster below and head to Gloucester Fair. Come and join Bob Wilsons Fun Fair as they come to Gloucester Park, Gloucester. You can expect to find an array of rides including Storm, Dominator Miami, Superbowl and much more! Dates: Look out for the dates for the fair in Gloucester Park to be announced for summer 2019. Normally the summer fair in Gloucester is one of the highlights of the summer. Gloucester Carnival is running on 13 July 2019 and fabulous finale in Gloucester Park where Carnival groups perform.